Company: Ladigesia roloffi (Jelly Bean Tetra) is best kept with other small peaceful species. Aquarium setup: Ladigesia roloffi (Jelly Bean Tetra) should be kept in a well planted aquarium with open areas. They prefer a dark bottom substrate. Never keep Ladigesia roloffi (Jelly Bean Tetra) in schools smaller then 10 fish. Feeding: Ladigesia roloffi (Jelly Bean Tetra) will accept flake food. 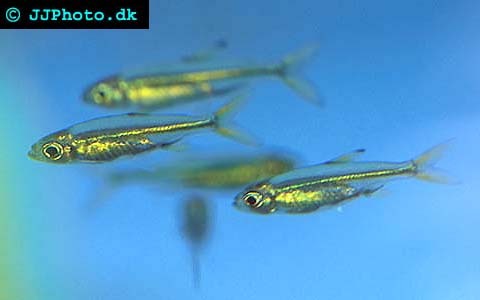 Breeding: Ladigesia roloffi (Jelly Bean Tetra) is hard to breed and if the fry is hard to raise after a successful spawning. This egg scattering species spawn in very soft acidic water. The fry is very small and hard to feed. The fry is too small to accept newly hatched brine shrimp until one weeks of age.